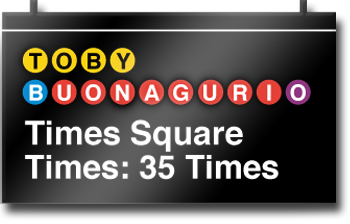 is a permanent public artwork commissioned from ceramic sculptor Toby Buonagurio by the MTA Arts for Transit. It is permanently installed in illuminated presentation windows embedded in the shiny new glass block station walls throughout the Times Square - 42nd Street Subway Station in the heart of New York City, USA. It is owned by the MTA New York City Transit. Toby Buonagurio and the photographer Edgar Buonagurio, are available for purchase exclusively through this official website.